The Resettable TelaDrop Drop-N-Tell can be installed on the outside of a package or product or discreetly tucked away so only the proper recipient knows that it is there. It can be reused up to 10 times, resists tampering, and cannot be mistakenly reset. 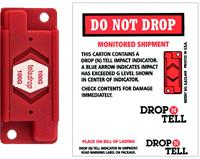 • Simple to operate: when an impact exceeds the rated G-range of the shock indicator, the bidirectional arrow windows turn from red to black indicating which surface of the package sustained shock. • The self-adhesive backing makes installation effortless - just peel and stick, or attach with screws using the predrilled holes. • Useful for monitoring sensitive products during assembly, such as computers. Came earlier than I expected, nicely packaged. exactly what I pictured and thought it would be. Easy to use. Thank you.